Without an effective wheel cleaner, your tires are subject to the constant abrasion of dirt and grime, which can wear away at the rubber and lining of your wheels. These natural corrosions can be absolutely detrimental to the quality of your tires, preventing you from getting the best use out of your tires. It is important to keep your tires protected from these naturally abrasive materials through regular tire cleanings. In this review, we will discuss one of the best tire cleaner gels on the market today. 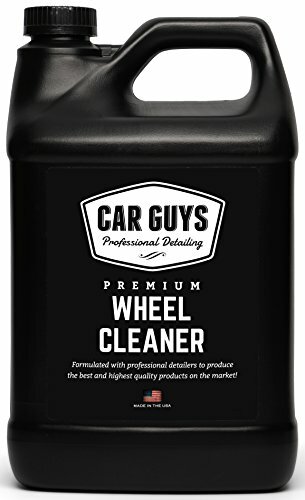 CarGuys premium series wheel cleaner is a highly concentrated cleaning gel, but this non-toxic and pH-balanced formula will safely remove the toughest brake dust and road grime on any wheel or tire. The cleaner will not damage the vehicle’s paint calipers or braking systems and is safe to use on all types of wheels including allow, chrome, aluminum, steel, polished, anodized, painted, Plasti Dipped, powder-coated, and non-coated wheels. If it’s not on this list do not be concerned this cleaner will get the job done! Administering the product is simple. Step one is to shake the bottle before use. Next, you must spray the gel evenly onto the entire wheel surface and let the cleaner sit for a minimum of three to five minutes. Do not waste the product by over spraying. A little goes a long way! For the best results, you will want to rub the gel into the tire by lightly scrubbing the wheel with a brush or a sponge. This will allow the gel to be driven into the pores of your tires. Finally, you will want to spray off the gel with a high-powered stream of water until all of the product is removed. You will want to immediately dry the wheel to avoid water spots and ensure that there isn’t any additional product left on the tire. Highly Effective – This is a proven product that allows you to quickly remove the natural dirt, salt, and grime that collects on your tires and prevents them from performing at optimal levels. Affordable – As far as market costs go, this is a product that doesn’t break your budget but still maximizes the value of your tires for extended usage. Simple to Use – This product doesn’t come with tons of directions or instructions—and it doesn’t need to. Simply apply the product evenly and wash it off. You’ll be amazed at how effective the product is at removing the grime off of your tires almost instantly. Zero-Risk Policy – CarGuys is so confident in the products that it releases that if you find yourself to be unhappy for any reason at all, the company will immediately refund your full purchase price. Even if you use the entire bottle and find yourself unsatisfied, you will be entitled to a full refund. Talk about good customer service! CarGuys has created an extremely effective gel that is powerful, so you’ll want to make certain not to allow the product to sit on your wheel for a long period of time in direct sunlight. It is a gel that is safe and effective for all types of vehicles, and it will brighten and clean white-wall tires as well. Some housekeeping tips are to never spray the wheel cleaner onto a hot surface. Your wheels’ brake calipers and rotors should be cool enough that you are able to touch them with your bare hands. If your vehicle has been sitting in the hot sun or if you have just finished driving, simply wait for them to cool down or spray them with some water. After cleaning your wheels, do not let them air dry. After you have thoroughly rinsed the cleaner off, it is recommended to quickly dry your wheels with a towel before continuing to wash the rest of your vehicle. This ensures that the cleaner is completely removed from the wheels and will prevent any risk of damage caused by water spots and oxidation. Q: Does it help remove small rust spots? A: If it is just small surface rust caused by brake dust, yes, it will. Q: Does the wheel cleaner have a strong chemical smell? What does it smell like? A: No, it does not have a strong smell. It smells like a regular soap product. Q: Is the gel as effective for motorcycle tires? A: The product is an excellent tire cleaner for any type of vehicle. It does not leave a shiny or greasy finish as it was made for cleaning. Q: Can the gel be added to a pressure washer soap reservoir and be used to clean the undercarriage? A: It is a thicker gel intended to cling on to wheels, so it would need to be watered down. Also you would need to make sure you’re able to properly rinse all of the product off. It is recommended to use this product exclusively for your tires. Q: What if you have non-coated aluminum wheels that have road salt on them? A: If this is the case, then it sounds like your wheels have become oxidized. We recommend to try a metal polish and buff them out with a polishing pad either with a hand-held drill or by hand. Q: What is the pH Value? The pH level is 8. If you have driven during the dead of winter, then you understand what it is like to have your tires packed with harmful salt, gravel, and corrosion. Without an effective tire cleaner, your wheels are subject to constant wear and tear. CarGuys makes the decision simple and easy for you with this effective product. If you find yourself to be unhappy with the product for any reason, you are entitled to a full refund, guaranteed! The founders of Chemical Guys have truly created an incredible product. Their solution is perfect for custom wheels since it removes dirt and debris from tires with a citrus-based formula that effectively removes corrosive brake dust, oxidation, oil, and dirt. The solution can clean chrome, painted, polished, and powder-coated wheels and can be diluted for various cleaning needs. Citrus Smell – The product comes with a naturally occurring citrus smell that provides a great finish. The smell of this cleaner will make you want to wash your entire car with the highly effective material. Multi-Use Nature – Unlike many tire cleaners, this is a gel that can effectively be used in a variety of fashions to clean your car. No matter if you’re cleaning your spokes, doors, or windows, this cleaner provides you with the flexibility to effectively clean your entire car and more. Great Value – This is a product that will certainly deliver you the cleaning results that you are looking to achieve without breaking your budget. Compared to several other cleaning products on the market, this gel stacks up favorably. Residue – Some customers have complained that the product leaves a lot of residue that is difficult to wipe off. Using a special cleaning brush and lots of pressurized water may prevent this complication. No Guarantee – Unlike the gel produced by CarGuys, we couldn’t find a secure money back guarantee with this product. Some manufacturers resort to caustic acids and heavy alkaline compounds to cut through brake dust. These cleaners are corrosive themselves and destroy shiny wheel finishes and car parts over time. Chemical Guys’ wheel and rim cleaners are pH-balanced, gentle, and perfect for cleaning any type of shiny wheel finish on any vehicle. Clean off any painted wheel, polished metal, chrome, anodized, powder coated, or wrapped wheel without fear of tarnishing or destroying the finish in any way. The gentle formula is safe to use around any other car part, including exterior paintwork, glass, clear plastics, and undercarriage parts like fender liners and suspension components. Simply rinse off any overspray without fear of etching or staining any other car parts. Brake dust and road filth are not just ugly; they’re powerful and can destroy your wheels. A combination of raw steel filings from brake rotors, burnt asbestos brake pad material, and cooked carbon from the intense heat generated whenever braking likely covers your wheels and other areas of your car. Intense buildup and rust, if left uncleaned, can interfere with the functionality of your car. Use this Chemical Guys car cleaner to remove these harmful buildups. Q: What is the difference between CLD and the Diablo Gel? A: Diablo is more of a wheel soap that targets brake dust while cleaning the rim, and it works well in a spray or in a bucket of water and brushes. The signature series is a standard wheel cleaner, and it can also be added to a bucket; it is just more of a general cleaner. Q: How do you take the cap off the bottle so you can dilute it? A: The bottle comes with a sprayer, though they are two separate items. The solution bottle has its own cap that you can take off and then replace with the sprayer. Q: Why use this product? Is it non-acid and safe for all wheels? What dilution ratio do you recommend? A: Chemical Guys is a very well-known brand and is very easy to use and won’t smear your rims. Dilute 1:3. Q: What is the difference between this and the Chemical Guys premium blue wheel cleaner? 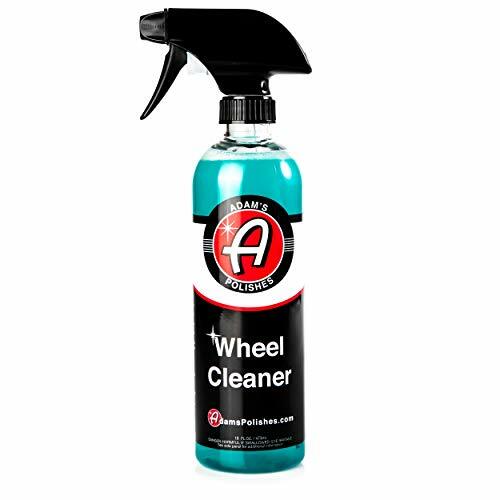 A: This is more of an all-purpose wheel cleaner that will help remove brake dust. The other is a brake dust-specific cleaner. Q: Does it work on chrome? Q: If you wax your rims, will this remove the wax? You can clean your waxed rims with this product, and it will leave the wax intact and remove the grime. If waxed properly, your rims should not need re-waxing for three to six months while using this cleaner. This Chemical Guys product lifts away stuck-on brake dust and road grime with concentrated suspension technology. The thick wheel-cleaning soap comes oxygen infused with a foaming action that gently removes abrasive filth from wheels, tires, and brake components. This product is a pH-neutral wheel cleaner safe for use on any and all shiny OEM and aftermarket wheel finishes, including painted, powder-coated, chrome, carbon fiber, polished metal, and glossy vinyl finishes. The thick soapy cleaner comes fully concentrated, so mix three parts water to every one part gel in a sprayer bottle for the perfect balance of spray ability and wheel-cleaning grunt. Simply spray the red gel over the wheel and scrub any brake dust, road grime, dirt, grease, oil, or spilled brake fluid with a soft-bristle brush. This cleaner is non-caustic and safe for use on brake components and materials like painted or powder-coated calipers, steel rotors, carbon ceramic rotors, pads and shoes, and all types of brake lines and sensors. Cleanse even the filthiest wheels with Chemical Guys and make your car look brand new again! Adam’s serve up a great and affordable method of giving your wheels a really deep and thorough clean. The uprated formula changes color to show you it’s working as it scythes away the accumulated grease and grime from your prized alloys. The simple spray ensures that application is a breeze and you should get plenty of use from the 16oz bottle. If you like the no-nonsense nature of sprays, this deep wheel cleaner from Adam’s might be just what you’ve been looking for. Simply spray the cleaner on quite liberally and you’ll kickstart the deep cleaning process. As the chemicals start working, the liquid changes color so you can see it getting the job done. This spray also functions as an effective fallout remover making it a multipurpose addition to your detailing kit. While the price is higher than some of the competition, if you compare what you’re spending to the bill at a detailing shop, it suddenly starts to seem like great value not expensive. If you’re after the convenience of a spray-on wheel cleaner that can help restore shine to dull metal, TriNova has you covered. Since wheels are made from a range of materials, this cleaner is expressly designed to be gentle enough to get all metals clean without causing any damage. The acid-free formula gives you added confidence that the integrity of your wheels is in tact. TriNova caters for everyone with this cleaning gel that deep cleans all types of wheel. The gel is slightly more awkward to use than a spray cleaner but in return you’ll find it works its way deep into the wheel and helps to make sure of a stunning finish. If your wheels have become dull or tarnished, applying this gel cleaner can help them regains some of their luster. Brake dust and the dregs left behind by oil clog up on your wheels over time. As this fast-acting gel works its way in, the powerful formula agitates, breaks down and gets rid of all this accumulated filth returning your wheels to their former glory. If you want a cleaner that serves double duty for both wheels and tires, Mothers cost-effective foaming spray is the obvious solution. You’ll need to check carefully that this spray meshes with the metal you’ll be cleaning, as it doesn’t go well with aluminum or anodized wheels. For most other purposes, you’ll get a quick and effective clean at a price you’ll love. 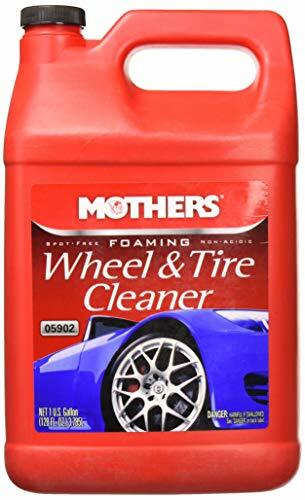 Mothers delivers a fantastically simple spray-on and hose-off cleaner that will buff up your tires at the same time as cleaning the filth from your wheels. Available in a range of bottle sizes and bundles, choose what makes most sense for your cleaning needs. As well as being slightly more limited in terms of compatibility, this spray is not quite as heavy-duty as the other cleaners we review so think quick once-over rather than detailing shop clean. Overall, the convenience and versatility of this Mothers spray combined with its attractive price means it’s well worth adding to your cleaning arsenal. How Do I Know if My Car Needs a New Set of Tires? Snow Tires vs. All Season Tires – What’s the Difference?